Try mouthwatering rings of Dried Apple and deliciously spicy, sweet Cinnamon Apple Wedges, a combination that works every time. 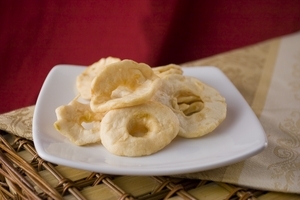 You'll quickly discover there's a certain elegance in their dense-textured sweetness. Snack heaven awaits with our nutritious dried apples. If an apple a day truly keeps the doctor away, then buy bulk Dried Apples to ensure you always have this healthy and enticing fruit on hand. 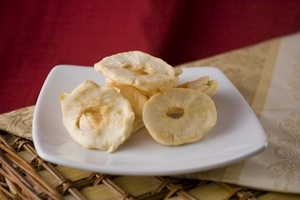 Dried apple slices are a popular choice among health-conscious consumers. Delicious as a snack or a dessert, dried apples are tasty when eaten alone or dipped in creamy, dark chocolate, buttery caramel or other creamy, sweet delight. The Superior Nut Company offers several sizes and varieties of bulk dried apples, both without sugar added and with a sensational sprinkling of cinnamon (every apple’s best friend). Delicious as a snack or a dessert, these delightful Dried Apples are tasty when eaten alone or dipped in dreamy dark chocolate, buttery caramel or any creamy sweet treat. Apples are one of the best fruits to include in your diet regularly. 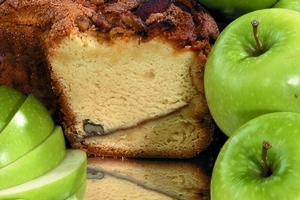 Phloridzin, an important, but difficult to obtain flavanoid found in apples works together with boron to improve bone density. Numerous studies have touted the benefits of eating apples every day, including for the prevention of certain cancers of the lung, breast, colon and liver. Additionally, the quercetin in apples may protect brain cells from the free radical damage that can lead to Alzheimer’s and Parkinson’s. Pack Dried Apple in your children’s lunches, or chop and bake into breads and pastries. Treat yourself to scrumptious Dried Apples ready to be dipped in velvety chocolate ganache, or try Cinnamon Apple Wedges served with hot cider in the dead of winter. The possibilities are endless when you order premium Dried Apples from Superior Nut Company.